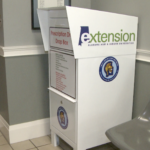 Residents in pike county are now offered a safer way to get rid of old medications and prescription drugs. A prescription medicine drop box has been placed inside the police station to help fight a major problem. Police officials say they see several cases each week involving prescription drugs. Residents can now simply walk into the station, put the prescriptions into the box, and walk out. Weed says it makes it easier for residents to dispose of the prescriptions properly. “If you got some old medicines or what not, and you need to try to get it out of the house so its not laying around, and a target, then you get rid of it in a proper manner,” Weed says. The drop off box will be available 24 hours a day, seven days a week. It takes the place of drug take back events, that were only held a few times through out the year.